A Sunbury Resident tells a different story about city code officers. A Sunbury mother has contacted Not The Item, incensed by what she read in the Daily Item today about “resident after resident” lining up to sing the praises of city code officers (Wednesday June 12th), and has asked us to tell her very different story. Her son, daughter and grandson share a rental property on the south side of the City, which was inspected earlier this year by code officers Swope and Rhodes. The inspection, which she described as cursory at best, lasted all of 10 minutes. They reported no defects, but were supplied by her daughter with a list of things which she thought were in need of attention. However, the following week when a plumber arrived to take care of some of these issues, a very different picture emerged. 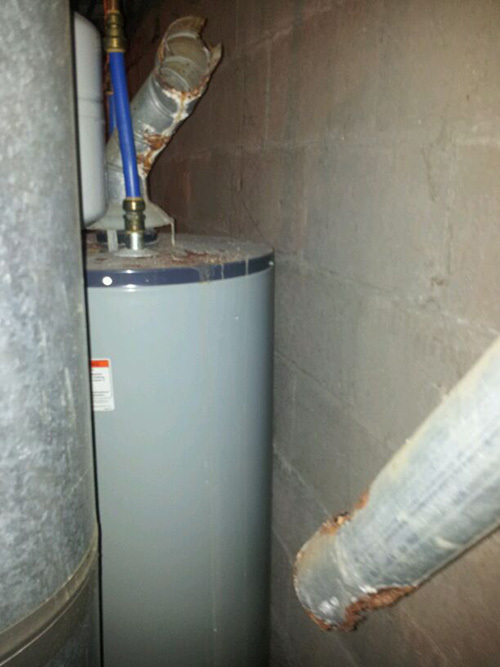 Death Trap – Showing Broken Water Heater Vent Pipe. On going down to the basement to turn off the water, he immediately noticed that the water heater vent pipe had corroded and sheared off above the heater, and part of it was hanging uselessly from the wall. The water heater had been belching out poisonous carbon monoxide fumes directly into the basement area whenever the heater was on, and, it appeared, had been doing so for an extended period of time. Look at the pictures. How could a trained person miss this? Well, apparently the Sunbury code officers did, despite looking around the basement during the course of their inspection. Her son, daughter and grandson had been experiencing headaches, nausea and tiredness for some considerable time. Her daughter had recently lost the baby she was carrying. According to doctors, all of this could be attributed to carbon monoxide poisoning, and subsequent tests of her daughter and grandson revealed elevated levels of CO in their systems. They had been extremely lucky and all of them could have died! Apart from the speedy actions of the plumber who also installed a new vent pipe, possibly the only thing which averted a tragedy was the drafty nature of the property, due to its many ill-fitting windows and doors. However, long term exposure to low levels of carbon monoxide can, in itself, lead to numerous medical problems. We were told that an attorney is being consulted about this case, and also that neither Mr. Swope nor Mr. Rhodes had bothered to reinspect the property to insure that all outstanding issues had been dealt with. When contacted, City Safety Officer Joe Bartello said he was aware of this incident and it was currently under investigation. He added that a full inspection carried out as per city requirements should take around 40-50 minutes to complete, which is why a charge of $50 is made by his department. If any reader has issues with Sunbury City Council, then please use our “Contact Us” form to pass on the details. We are especially interested in code enforcement issues and inconsiderate use of chimineas and fire pits. Do not worry about possible retaliatory action. We guarantee we will publish no identifying information if anonymity is requested. Wow. Reading some comments on here, especially Ms. Heller’s, is mind boggling. Ms. Heller, you come on here and throw around sanctimonious comments like a shot put. Since you have not produced any evidence yourself, your input is nothing more than opinion. It sounds to me like you are trying to curry favor. You state that – and I quote “Just because someone says something does not make it true” end quote. Maybe you should follow your own advice. If you read the post correctly, it says all of this “could” be attributed to carbon monoxide poisoning. Not that it did. And subsequent tests showed elevated CO levels in their blood. Also one distraught woman’s accusations- it was the mother of this woman not the woman herself. You only see what you want to see. Have you read Shakespeare? Probably not, however in Hamlet it states “The lady doth protest too much methinks.” When you have to work as hard as you do contradicting posts on here I do believe this statement is very apt. Another quote from you that is up for debate. You throw people under the bus and as soon as someone stands up to you, you pull out the old you know nothing about me line. Hypocrite comes to mind. And I don’t need to know you, this comes through loud and clear in your writing. And tenant responsibilities, don’t you think that paying the rent falls into that category? You needn’t bother to reply to this as I won’t be reading it, my time is too valuable to spend reading your dubious opinions of me.